Last week Sweet Pea turned 6 months old. She has achieved all the typically-listed signs of readiness (sitting, interest in food, etc.) except for teeth, so I have been thinking that it's time to try some food that she can actually eat, rather than just lick. On a few different days over the last two weeks I tried sharing some home-made, mashed or pureed, baby foods with her. We tried avocado, then sweet potato, then applesauce, then peaches. Yes, I was totally breaking the rule about only one new food every four days. There are no allergies in my family and these are low-allergen foods, and of course I carefully watched her during and after trying to feed her. With each of these I set the food on a tray in front of her, and took a taste myself to show her, then Average or I tried giving her a fingertip bite. She tasted at least a little bit of each, but the only thing that didn't get a 'yuck' face and quick spit-out response was the applesauce. I've heard it can take up to ten tastes before a baby will like a food, so wasn't worried, but was a little disappointed that she didn't seem to enjoy anything. Then, one night I ate dinner a friend's house and Sweet Pea was reaching for everything on our plates. My friend held Sweet Pea in her lap and let her grab some of the leftovers from the plate. Sweet Pea grabbed and put in her mouth: baked potato, watermelon, and a corncob. 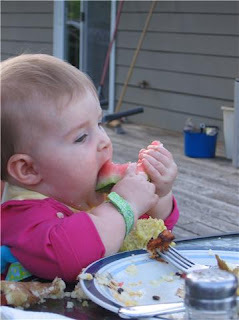 She was enjoying herself and seemed to be enjoying the food a little and actually eating some of it, so maybe there really is something to the baby-led weaning idea of self-feeding regular adult food! It looks like I'm swinging back to the baby-led weaning side. I'm not in a rush to get her to eat a lot since she is gaining plenty of weight just on breast-milk and is still only waking 1-2 times/night to nurse. So, my plan is to continue to slowly introduce new things, in sizes that she can grab and self-feed. I hope the frozen peaches and sweet potato purees don't go to waste. I can always cook with them, I guess. Or maybe she'll like feeding herself these eventually? But I don't think I'll miss skipping over the spoon-feeding purees stage, begging and/or tricking my baby to open her mouth to stick food in, as I've seen people do sometimes. I am discovering that with parenting, the best laid plans are not always what actually works with an individual baby. So, I might be updating that I've totally changed my mind again in a few weeks. What did you do with your baby? Or what do you plan to do with your future kids? We started solids at 5 months even though I said I wanted to wait until 6. He just wanted food so much! I make all his food and it is so easy and cheaper. I do keep some gerber that I get on sale around for those times I run out and don't have time to make more. I have been increasing the solidness of the food to get him use to more texture. He never spit out food! He's always been a good eater. We started with sweet pots and avocados. I think you just have to watch your baby and see when they are ready. No one knows your baby like you do! This BLW stuff makes a lot of sense to me. I'd never given any thought to it other than thinking I'd probably prefer to puree my own baby food, but it does seem like a fairly traumatic and trying experience to do the forced spoon feedings. I'm interested to hear more about this! Melissa - Thanks for sharing your experievce. That must be so much fun to try the different foods! I guess maybe Sweet Pea is just not ready yet? Just like everything else, I am learning, it varies so much from one child to another! Ann - I will keep updating as I go. There are some crazy (interesting) videos out there of babies feeding themselves broccoli crowns and whole fruits. Such a neat concept, to me. Look at Sweet Pea go! Rose, you are just amazing. And the blog is looking wonderful! I definitely feel like I get a lot of interesting information and thoughts to ponder when I read your blog. You rock!